As a custom invitation studio, we can create anything you envision for your event! Whether you are having a traditional, modern, or destination wedding, our creative team has got you covered! If you aren’t interested in a custom design, check out our Design Bar Collection, and affordable, fully customizable set of invitation templates that offer quick turn-around times. Not sure which direction you want to go? Here’s the breakdown of each option. We’re confident that one of these designs will be the perfect one for you! With the Design Bar Collection, you’ll find ready-made designs that you can fully personalize to your taste! We like to think of this collection as the “little black dress” of invitations – classy, timeless, and suitable for a variety of wedding styles with the right accessories. We start working on your design as soon as you fill out your order form with your wording & wedding details and make your deposit. We’ll guide you through the design process, bringing your vision to life by tying all your favorite elements together for a cohesive and beautiful look. We’ll also help you select the perfect ink & font options that fit your wedding style and advise you on all the best practices for wedding etiquette. Each invitation is printed on luxurious cotton paper stock. You can choose from our standard one-ply paper or upgrade to a thicker two-ply option, and you can select colored paper & envelopes, as well. We offer three printing options to suit every style and budget: letterpress, foil stamp, and digital print. We’ll walk you through each option and help you decide which one is right for you. Feel free to personalize any of our designs to fit your wedding style. Pick your favorite ink colors, fonts, print methods, paper weights, paper sizes, envelopes, and liners. 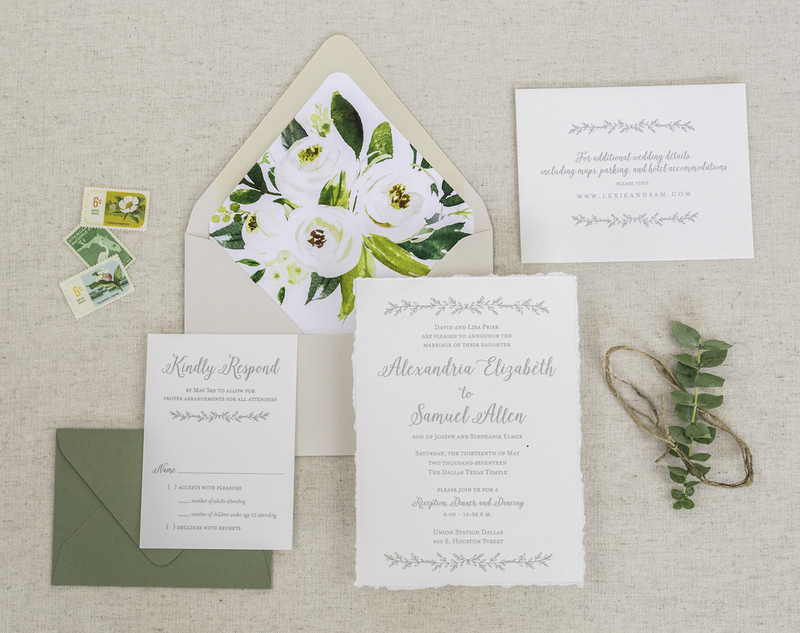 You can further customize your invitation suite by combining elements from multiple designs or by adding other design details like a monogram or custom map. 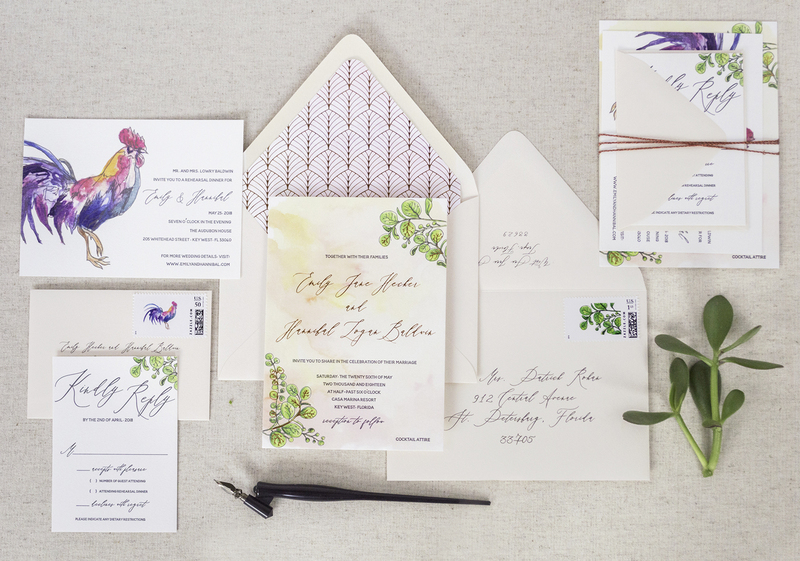 Our collection is designed to give you the freedom and flexibility to personalize your invitation suite any way you want! Add some beautiful accessories to take your invitation suite to the next level! Get creative with wax seals, silk ribbons, bellybands, pocket folds, calligraphy, custom postage, and much more! Check out our Accessories page for more ideas. Design Bar options offer the quickest turnaround time (4-6 weeks from concept to final delivery). We’ll send you the first digital proof of your invitation suite 3-5 business days after receiving your deposit and wording details, and we’ll go to print after receiving your final approval on the design. It takes 10-15 business days (2-3 weeks) for printing to be completed. 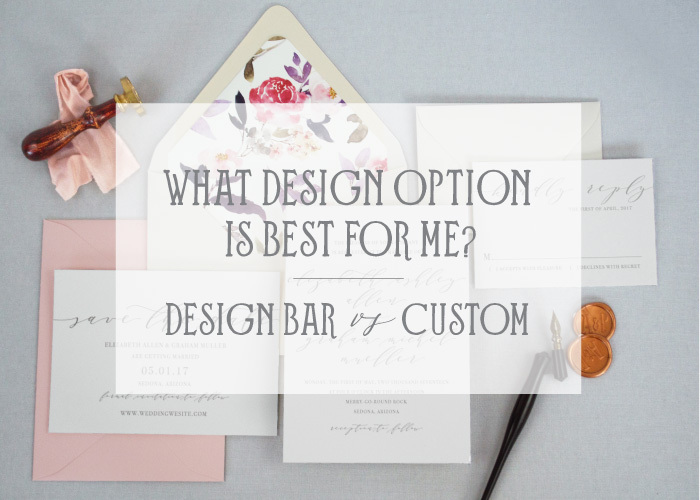 The cost for Design Bar invitations varies based on the printing method you select and your desired quantity. For letterpress, the typical invitation suite* starts at $635 (qty of 50). For foil stamping, the typical invitation suite* starts at $1,050 (qty of 50). For digital printing, the typical invitation suite* starts at $331 (qty of 50). *Invitation suite include main invite, rsvp, outer envelope, and rsvp envelope. Do you want a one-of-a-kind invitation suite that brings the “Wow!” factor to a whole new level? Then our custom design process might be the right one for you! We’ll create your bespoke design based on your story and tailored to your specific wants and needs. From creating an impactful first impression with your envelopes to developing a one-of a kind design, we’ll walk you through every step of the process with professionalism and expertise. Once we have a clear vision of what you are looking for, we’ll provide you with a detailed, à la carte quote. This will allow you to see what each item costs so you can select your favorite items that work best with your budget. Whether you decide to personalize an invitation from our Design Bar Collection or create a Custom Design, we guarantee you’ll be thrilled with the final result!